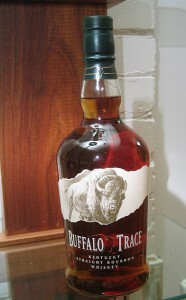 Notes: This whiskey is produced at the scenic Buffalo Trace Distillery in Frankfort (close to Woodford Reserve Distillery if you are touring) home of numerous other whiskies such as Eagle Rare 10 year-old, Eagle Rare 17 year-old, Blanton’s, Rock Hill Farms, Hancock Reserve, and Elmer T.Lee. (See our Adventure Section for a tour of the distillery). This is not a single barrel (see above) but a small batch from the mixing of 25-30 barrels per batch from the sweet spots in the middle of I ,C, and K warehouses. Appearance: Wonderful golden red in the bottle, more gold / bronze in the glass. First Impression: Corn and rye, which end up smelling like vanilla and mint. You can smell the oaks influence on the whiskey in the peppery scent towards the end. Nice edge line on the glass when you swirl it and some legs to it. Mint/vanilla comes out more after a while along with a cardomon scent. Taste: Wonderful thick mouthfeel, warming but not burning at first. Smooth sweet honeyed notes with oak pepperiness at the end and a aftertaste of vanilla, fruits, mint and a warming heat. Goes down the throat with a warming pleasant burn. Lets you know you are drinking whiskey but doesn’t punish you for it. Drinks: Makes a great Manhattan or Old Fashioned. Stands up well to the vermouth in a Manhattan (any of the basic 3 types) and mixes well for the Old Fashioned. Unlike some high end bourbons, it doesn’t give a lot of ground to the other ingredients and so produces a good balance in a drink – it also doesn’t get lost in, or overpower the other ingredients. Final Thoughts: A very easy to drink, quality bourbon, mellow and rich at a great price. A wonderful rich bourbon that puts the other bourbons in its price range to shame. There are few others that are is good for the money and they make most of them. Bottle: The clear glass showed the whiskey to good effect. Coupled wth the old- style shape and torn parchment style label it is easy to spot. The graphics and collar band are also well done, in a minimal sort of way. The ergonomics of the bottle make it easy to grasp and pour (especially the neck), but also give the impression os solidity and heft. The attention to detail is not only in the whiskey, but extends to the packaging as well.